The former Indian Prime Minister, Pandit Jawaharlal Nehru, the architect of the modern Indian nation-state, also wrote in his autobiography, “No country or people who are slaves to dogma and dogmatic mentality can progress, and unhappily our country and people have become extraordinarily dogmatic and little-minded.” On being queried over Communism, the prolific writer in English once said, “The danger to India is not communism. It is Hindu right-wing communalism.” This non-Buddhist scholar is seeing and hearing, in his own words, ‘Buddha preaching his first sermon… ‘words come like a distant echo through two thousand five hundred years’, while we strive to engage in communally based nationalistic ideologies, religious dogmas created by numerous so-called Buddhist scholars, academics ‘researchers of truth’ in Buddha’s word or following teachers of countless factional theorists and ideologists. These fanatic ‘theologians’ do misguide, misinterpret and misdirect the unsuspecting laymen into different whimsical paths and ways prescribed by them. Queen Mahamaya had an unusual dream on the Esala full moon day, ‘A ring of snow covered the sky punching mountain; the air was chilling and mumbling, the apex of the Himalayan range was drenched in brilliant light, when four custodian deities of the earth carried her in an elegantly crafted gorgeous couch to the snow clad foothills of the Himalayan Range. A white skinned baby jumbo carrying a white lotus, the foremost symbol of beauty, prosperity and fertility; that represents eternity, purity and divinity, in its trunk had entered her womb from the right side of the abdomen, as the Queen was suddenly awakened. The conception of Prince Siddartha in Queen Mahamaya’s womb is considered an important event that took place on this day. The Buddha’s message in Dhammacakka pavattana Sutta: setting the wheel of dhamma in motion was both shallow & simple but deep and profound. Superficially, it conveys that neither a life of self-indulgence nor one of self-mortification can guide to happiness or emancipation; but only a middle path, evading these two extremes, leads to tranquility and calm, wisdom, & total liberation from the discontentment of life. An in-depth investigation reveals the profound meaning of his statement as explained in Sathipattana, the only path; mindfulness bhavana or focusing on the present moment undisturbed by or without the interference of thought. 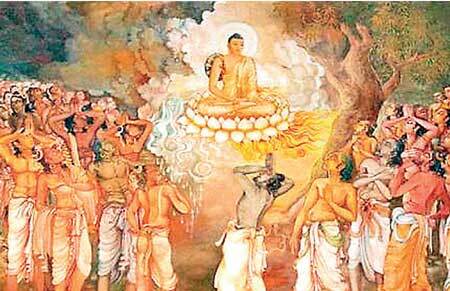 Seven weeks after the attainment, the Buddha delivered His first discourse, the Dhammachakkapavattna Sutta where he described the Four Noble Truths and the Noble Eightfold Path to the five Ascetics, Kondanna, Vappa, Bhaddiya, Mahanama and Assaji in Benares. The commencement of the rainy season begins from the month of Esala. If one avoids two extremes, one Lives in the present moment; that is Bhavana. It is important that we understand the statement ‘living in the present moment’. The demand the urge to follow somebody is very strong and is a part of our tradition, part of our culture. That is why there are so many modern sects, mushrooming little or big; both Bikkhus and lay preachers conducting classes where you are told exactly what to do. They display authority of so-called spiritual leadership. They try to mould followers into a new pattern unique to each ‘school’ of thought. The more there is chaos in the country, the more there are the so-called sects which are essentially concentration camps to twist the people, to mould the followers, to force them to a certain pattern. The Guru, the boss or the leading preacher, the authority tells them what to do; and they will promise them an amazing future. The imperceptive, insensitive persons accept them because then they have physical security. Will meditation help you to acquire a habit of unattached view as an observer, if it is possible that is for the moment only. Medical research has proved the benefits of meditation for our body. According to research carried out by the University of Wisconsin, meditation produces changes in immune-system beneficial to functioning of the body. They have found 50 percent more Neuro-electrical activity in the left anterior regions of the brains of the meditators. Samatha meditation is an effective but gentle way of calming the mind. There are more than 40 kinds of meditation techniques to practice out of which Mindfulness of breathing or anapanasati is the most popular. Here you sit in your normal meditative posture; the teachers say, it is important to keep the spine, the main conduit of our central nervous system erect and focus your mind on the area between your upper lip and the nostrils as the passing breath touches the skin. The other method described and practised is vipassana meditation. In vipassana or insight meditation, thoughts, feelings and actions are being used to gain insight in the true nature of reality. Can you look at things as they are, not through images that you have built upon them? If you do so you are looking at ‘what is’ not attempting to interpret in terms of your personal tendencies and inclinations or not directed by circumstances. You are always guided by tendencies and inclinations, therefore we never look at ‘what actually is’. Bhavana is not control of thought like in meditation; when thought is controlled, it only breeds conflict. Your brain stores up memories - you can observe this yourself. If it had not stored up memories it would not be able to think at all. That memory is the result of experience, of knowledge. Thoughts bounce off from that store of memory. Therefore thought is never free: one cannot be free of thought and thought can by no means be free in itself, it is the product of past memories, experiences and understanding. One must have this buildup of knowledge, otherwise you could not function. First of all let us remove erroneous ideas about concentration, meditation and Bhavana.